UNITED NATIONS, December 14 -- Saying he will make the UN relevant, Secretary General Ban Ki-moon on Wednesday was asked for his views on the increasing use of drones for cross border airstrikes. Ban responded that he has no comment, it is up to member states what equipment they use. One wondered, would that apply to white phosphorous or cluster bombs? This is Ban's relevant UN? Prior to Ban's "year end" press conference on Wednesday, Inner City Press twice asked his spokespeople if Ban had any comment on the deadly US drone and airstrikes in Pakistan and if Ban raised them in his meeting with US Secretary of State Hillary Clinton in Bonn, all without substantive answer. Wedensday in response to the first of the 14 questionsthat were allowed to be asked, Ban claimed he has transmitted the report on Syria to the Security Council and General Assembly. After Ban was challenged on it, his spokesman Martin Nesirky handed him a note which he read out: the special rapporteurs don't report to the Secretary General. 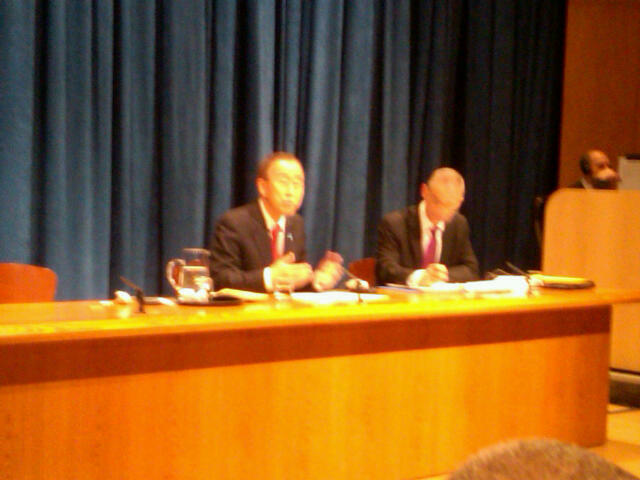 Ban's most animated answer, some thought, was to a question about the Korean peninsula. He said he was answering and acting in part as a Korean citizen. What then about South Korean authorities arrest of peaceful protesters, including an elected major, protesting the militarization of JeJu Island? Inner City Press asked Ban's office about the issue, without any answer. Since there's been no answer, we can only pass on new information: "On November 8 , three peace activists were arrested at Shilla Hotel, Jeju Island, South Korea, where Republic of Korea-UN Joint Conference on Disarmament and Non Proliferation Issues was being held. On November 29 the prosecutor brought charges of trespassing. The first trial will be on December 15. I heard that you asked the UN spokesperson... I would like to know if you got any kind of answer from the UN." The answer is no. There were questions Ban was prepared for, such as his previous comment on whether the Palestinians should apply to join more UN agencies after the cut-off of US funds to UNESCO after Palestine joined. Ban looked and found an "if-asked" note, which he read trying to distinguish his stated support for the Palestinian people from concerns about funding gaps. Ban eagerly claimed to be trying to cut the UN budget, saying in particular the travel budget will be reduced by increased use of video conferencing. But there is increased grumbling about the cost and lack of transparency of Ban's own travel. Recent Inner City Press questions about this travel, including who pays for Ban's joint travel with the Qatari President of the General Assembly, have gone unanswered. Since December 1, the UN has dodged questions about the shakeup (or re-shuffling) of Ban's team by saying Ban would soon speak and take questions. But at the December 14 "year end" press conference, no questions were allowed on this. At Ban's "year-end" press conference on Wednesday, Inner City Press was not called on to ask a question, despite being inscribed sixth in the pre-taken list for questions. "Last month a claim was filed with MINUSTAH and your office for compensation for cholera in Haiti, alleged introduced inadvertently by UN peacekeepers. We keep being told that the filing, which criticizes MINUSTAH and the UN for not having established a standing claims committee, is "being studied." What is your awareness of and position on the claim?" Of the questions that were selected, many were general, about what Ban thought of the Arab Spring. One wondered, why not allow at least one question about what the UN actually does, rather than about Ban's views? Watch this site.